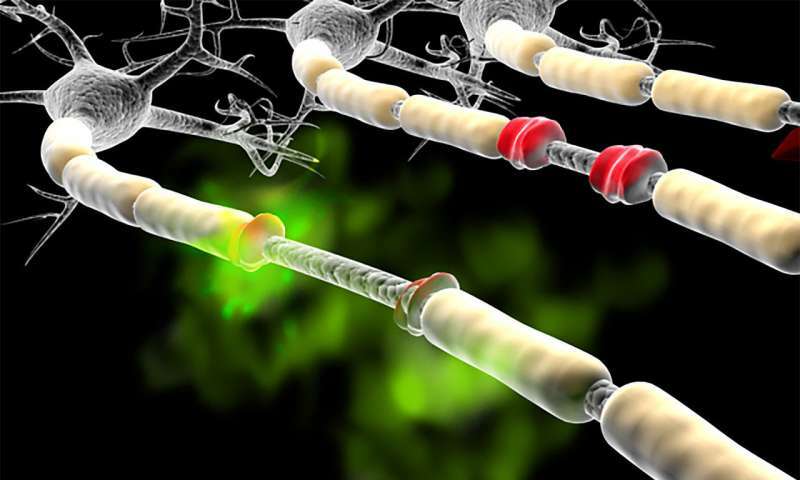 Possible biomarker for multiple sclerosis identified. A biomarker for multiple sclerosis that could be an early warning for the disease has shown promise in both human and animal testing. Researchers at Purdue University and the Indiana University School of Medicine found that acrolein, a molecule previously suspected as a metabolic waste product that accumulates in people with certain neurological disorders such as multiple sclerosis and Parkinson’s disease, could possibly be used to help diagnose MS. Multiple sclerosis affects an estimated 2.3 million people worldwide, according to the National Multiple Sclerosis Society, and an estimated 1 million people in the United States have MS. The disease usually is diagnosed between the ages of 20 and 50, and affects twice as many women as men. Although there is no cure for MS, recent years have seen a flurry of activity around possible biomarkers and possible treatments. Dr. David Mattson, professor of neurology and the director of the Indiana University Multiple Sclerosis Center, says that if the results are validated, acrolein could also allow medical professionals to monitor the effectiveness of treatments. Acrolein is a byproduct of fat metabolism. Dr. Riyi Shi, a professor of neuroscience and biomedical engineering in Purdue University’s Department of Basic Medical Sciences, College of Veterinary Medicine and Weldon School of Biomedical Engineering, has found that an accumulation of the molecule is present in animal models of neurological diseases such as MS, Parkinson’s disease, or even spinal cord and brain injuries. Acrolein is thought to damage cells by disrupting the lipids, or fats, that protect nerve tissue, in a process called lipid peroxidation. Shi said that both blood and urine tests, or assays, have been able to measure acrolein levels in humans and in animal models. “The levels of this compound in urine and blood is correlated—the MS patients that had the highest level of acrolein in the blood also had the highest level in the urine,” he said. According to Shi, it is, therefore, possible that a high level of acrolein is indicative of more active MS, though low levels of acrolein do not rule out the possibility of having MS. Further study is needed to vailidate these initital observations. Shi says the study also suggests that acrolein is not just a potential biomarker of MS disease activity but could also be a target for therapies. The two drugs in this category are hydralazine, used to treat high blood pressure and heart failure, and phenelzine, which is used to treat major depression. “Before attempting to repurpose these drugs to lower acrolein in MS patients, we plan to first confirm if acrolein, indeed, correlates with disease activity in MS through a larger clinical study with more participants,” Mattson says. “Then we need to show that these drugs can, indeed, reduce acrolein levels in human MS patients, and if lowering acrolein levels is therapeutic in MS.
“If it turns out these agents can reduce acrolein levels in MS and offer benefit for the disease process in MS, then patients on these agents for the blood pressure or psychiatric indications would get two benefits for one.”.